The NIDCD's mandate to conduct and support biomedical and behavioral research and research planning documents. 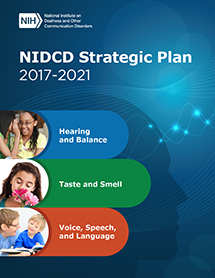 Strategic Plans help the NIDCD prioritize its research funding by identifying areas of outstanding promise, as well as identifying knowledge gaps. Important milestones and events in the NIDCD's history since its founding in 1988. NIDCD's staff, offices and divisions. Current and past congressional testimony and budgets. Information about and meeting schedules for the Advisory Council, Board of Scientific Counselors, Communications Disorders Review Committee, and Special Emphasis Panel. Talk to a health information specialist toll free, media inquiries, and technical questions. Activities and campaigns to engage the public and ways to make a contribution to help NIDCD.